AGS & Handrails fabricates aluminum handrails (both pipe and tube). These handrails are designed to utilize all the advantages of aluminum; where strength, durability and no-paint maintenance is a key factor. We use the highest quality materials to ensure a smooth finish, making it the finest contemporary railing design in the Midwest. 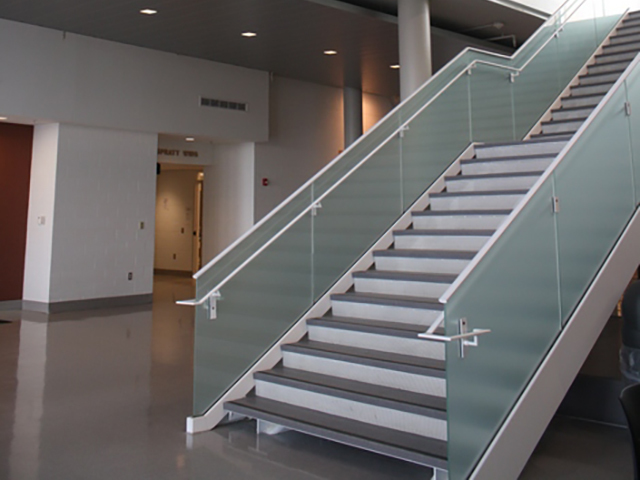 At AGS & Handrails we offer multiple option in aluminum handrails for your application. Our handrails can be finished and finalized in powder coat paint from a vast selection of standard colors. Giving our clients a custom look and feel to meet their interior needs. We have provided aluminum handrails for both commercial & residential clients. Here’s a list of our most recent projects: Staff College, Missouri Western Store University, Wall Street Tower Pool and Deck, St Teresa’s Academy, and Nevada Medical Center. Learn why aluminum handrails are becoming so popular in the architectural community. Contact us today and learn how aluminum handrails can dress up your current interior and make your staircase the talking piece of your architecture. Our team look forward to having you as part of the AGS Handrails & Corporation family. Trust us, you’ll fall in love with aluminum.